Leading indicators on a price chart are much like a yellow flag on a racetrack. It’s a heads up that a change may be just around the bend. It readies you for the next signal, the one that may indicate it’s time to snap into action. Some traders find that the easiest way to read leading indicators—including momentum, money flow, or overbought/oversold oscillators—is to look for chart divergences. That simply means spotting two chart elements that normally correlate, but currently are moving apart. Most so-called “lower” study indicators (moving average convergence divergence [MACD], stochastics, the Relative Strength Index [RSI], and so on) usually appear to move in the same direction as the price chart—both moving up or down, and at the same time. The astute trader watches for times when the lower study action diverges from price. Because reading and applying such divergences as a leading indicator works the same way regardless of the lower study, the approach described here can be applied to your favorites. Regular divergence appears before confirmation that a trend is about to reverse. 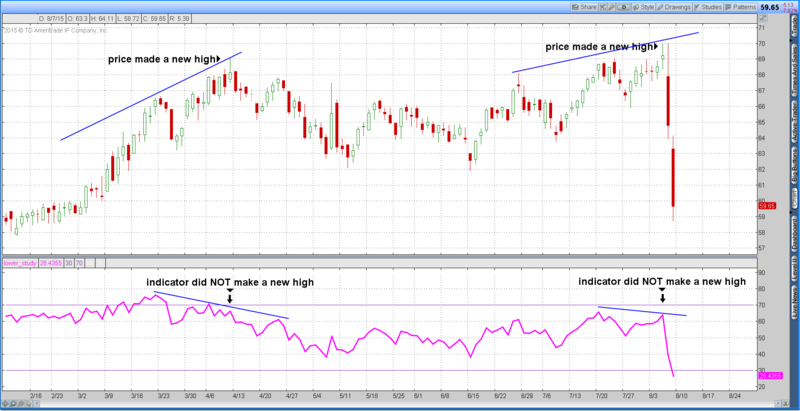 Hidden divergence provides confirmation that a trend is intact and likely to continue. Regular divergence is more common and easier to recognize. When a security’s price makes a new high, chart crosshairs on the new high and use them to check the lower study. If the indicator is not also making a new high, you have a divergence. Sometimes the indicator will be at a lower high, and other times the indicator will show a similar high. Either way, if the indicator is not making a new high at the same time that price is making a new high, there’s a divergence (figure 1). Some traders who notice the price is at a new high but the indicator is not will begin watching for confirmation indicators as potential sell signals. In other words, they trade in the opposite direction from the trend. FIGURE 1: BEARISH DIVERGENCE. The price marks a new high, but the lower study does not. Chart source: TD Ameritrade’s thinkorswim® platform. For illustrative purposes only. Past performance does not guarantee future results. The same analysis can be applied when price makes a new low (figure 2). Put the crosshairs on the new low and use them to check the lower study. If the indicator is not also making a new low, you have a divergence. When you notice price is at a new low, but the indicator is not, begin watching confirmation indicators for a potential buy signal (to trade in the opposite direction from the trend). 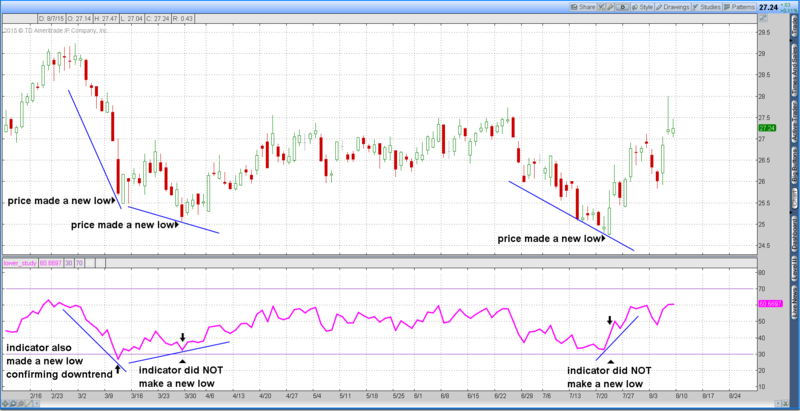 An example of bullish divergence (the price made a new low, but the lower study did not). Chart source: TD Ameritrade’s thinkorswim platform. For illustrative purposes only. Past performance does not guarantee future results. If you’re familiar with option strategies, you could use divergence as a trade trigger to enter a short out-of-the-money vertical spread in anticipation of a trend reversal. This risk-defined strategy benefits from time decay while waiting for confirmation of a buy or sell signal. Keep in mind that a regular divergence indicator for a potential buy or sell signal might appear in the near future, but it’s not guaranteed. Another way to trade regular divergence is to wait for a confirmation buy or sell signal before entering the trade. That signal might appear as a reversal candle pattern, where the price crosses a support/resistance line. Or it might appear as a trade trigger from a confirming chart study. Once the confirmation buy or sell signal appears, a directional trade could be entered using a directional option strategy or by buying or selling the underlying security. Hidden divergences are more difficult to spot because most traders focus on price action first. However, there are times when price is not making a new high or a new low but the lower study is doing so. This is called a hidden divergence and tends to act as confirmation of the current trend. When a lower study makes a new high, put the crosshairs on the indicator’s new high and use them to check the price chart. If the price chart is not also making a new high, you have a divergence. The price chart may show a lower high or a similar high. You can also spot a hidden divergence when your lower study indicator makes a new low, but the price does not make a new low (figure 3). FIGURE 3: COME OUT, COME OUT, WHEREVER YOU ARE. An example of bearish hidden divergence: The lower study made a new high, but price action did not. Chart source: TD Ameritrade’s thinkorswim platform. For illustrative purposes only. Past performance does not guarantee future results. FIGURE 4: READY OR NOT? Bullish hidden divergence happens when the lower study makes a new low, but price action does not. Chart source: TD Ameritrade’s thinkorswim platform. For illustrative purposes only. Past performance does not guarantee future results. Regular or reversal divergences may be easier to spot, but hidden or continuation divergences can precede powerful moves in the direction of the trend. Just as the yellow flag can be an important alert on the racetrack, the role of divergences between lower study chart indicators and price action can be invaluable to traders. 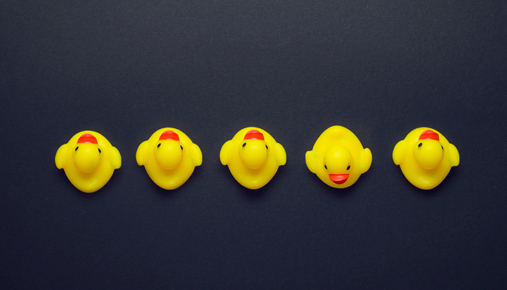 When they do their job, leading indicators simply get you at the ready in case you need to enter—or exit—a trade in the near future. See You at Market Drive? Test drive trading tools, hear industry-leading speakers, and experience immersive learning at Market Drive from TD Ameritrade.